2019 is just around the corner. Have you started thinking about how to grow and improve your appraisal business in the coming year? 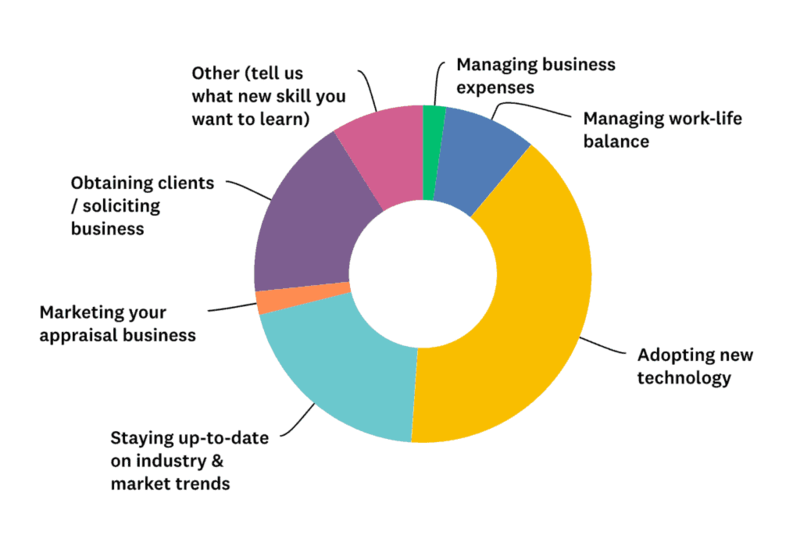 We recently asked appraisers, “What appraisal skill would you MOST like to learn (or improve) in 2019?” The results are in. Here are the top three appraisal skills that appraisers across the country are seeking to sharpen. What appraisal skill would you MOST like to learn (or improve) in 2019? Technology is by far the top skill that appraisers would like to improve. Appraisers are well aware of the importance of technology and its potential for increasing their accuracy and efficiency. However, many have trouble finding the time to research all the new technologies available—let alone finding the time to learn and adopt them. Others just aren’t very tech savvy and long for the good old days when an appraiser’s favorite tool was an electric typewriter and a glue stick. Have you, too, been slow to adopt new technologies? Set aside some time in the new year to figure out how to make technology work for you and your business. Appraisers know that continued education and keeping up-to-date with real estate market trends is essential in their field. Valuation metrics are always in flux, and staying informed on new developments will help produce the highest quality appraisals. But once again, time management is a roadblock for many. Luckily, there are plenty of resources available that can help you stay on top of your game—including online CE courses, webinars, blogs, podcasts, and books for appraisers. Subscribe to our blog or follow us on Facebook and Twitter to see articles, resources, and the latest developments in appraisal news. In addition to the top three appraisal skills above, appraisers also named managing work-life balance (9%), managing business expenses (2%), and marketing (2%) as things they’d like to learn or improve in 2019. Other responses included “regression” and “statistical analysis.” As previously mentioned, time management is yet another common issue among appraisers. If you can relate, check out our Time Management Tips and Tools for Appraisers. Gearing up to sharpen your appraisal skills and grow your business in the new year? McKissock is your appraisal wingman. Explore the Appraisal section of our website for info on license upgrades, CE courses, professional development webinars, and more.